With the Rajasthan-themed corner—pictures of Jaipur in the frames and Raja-Rani cushions adorning the couch—the theme and mood of Patricia's living room revolve around the color pink. In the South Indian middle-class Tambram household I grew up in, “decorating” meant the frantic dusting of the center table before a relative stopped by for afternoon filter coffee. Sure, we had all the trappings of a typical middle-class home—a giant picture-tube TV, a wooden showcase of brown Formica with shelves stopping mere inches from the ceiling, a few brass lamps from my mother’s trousseau, and perhaps a stray souvenir from one of our many temple-hopping trips. But a centerfold for Better Homes & Gardens it was not. Perhaps our décor-deprived yet typical home was also reflective of our conservative, salt-of-the-earth sensibilities. Who cares how the walls look if you feed folks great food and supply enough gossip/intellectual nourishment to keep them coming back? Take, for instance, Patricia Torres (coloursdekor.blogspot.com), who describes herself as an “ordinary person, a working woman, a mom, a wife, a friend.” When not at work at a multinational company in Dubai or tending to her daughters, she is busy at home “aspiring to see beauty in everything around me.” With a full-time job, she often wonders if she would have taken up design as a career if the opportunity had presented itself earlier in her life. It was a friend’s suggestion that she consider blogging about the million or so pictures she would take of things around her house that got her started. Her blog is her “design diary.” She manages to pull it off, blogging in between her day job, parenting and home-making. As a teenager, Kamini Raghavan (saffronandsilk.blogspot.com), would spend hours arranging and re-arranging furniture, artwork, and flowers around her house, though she just started blogging about design in 2010. For most bloggers I spoke with, blogging is a relatively new experience. While some bloggers are professionally trained in design and décor, a few have successfully turned an amateur interest into a nearly full-time career. Kamini, who originally earned a degree in Economics, went back to school in the 1990s to earn a degree in interior design. She worked in the industry for nine years in the U.S. before moving back to India in 2006. Sudha Sundareswaran (adesignenthusiast.blogspot.com), grew up helping her grandfather with his various woodworking projects, picking up carpentry skills along the way. 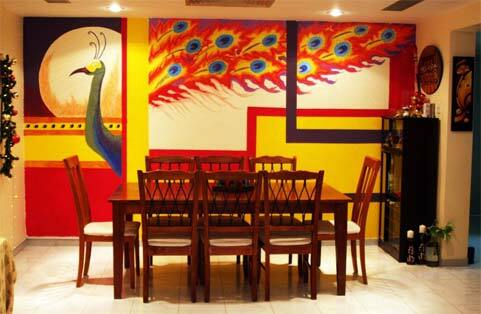 Therefore, Sudha sees herself more as a design enthusiast than a decorator. She started her design blog more as a way to attract attention to her original blog on green/environmentally conscious living. As a result, she now juggles between three blogs—cooking, design, and green living. Anuradha Varma (mydreamcanvas.blogspot.com) reminisces about decorating her own room as a kid, and being extremely possessive of the knick-knacks that she would randomly pick up. She started blogging in 2008 more as a way to chronicle her own experiences with design and décor. Her lifestyle blog, My Dream Canvas, evolved out of the countless hours she spent browsing through design-and-décor magazines and a desire to critique them. She blogs full-time and loves every addictive minute of it. A chance visit to any one of the blogs featured here will clue you in to the sense of camaraderie and bonhomie that prevails in the community. Bloggers regularly feature others’ blogs and posts, invite guest blogs, and organize frequent giveaways that mutually benefit each other’s blogs. A good majority of the readership is drawn from the Indian community at large, whether from India, the U.S., the U.K. or the Middle East. Many bloggers have also tapped into the larger cosmopolitan global-design blogging community. 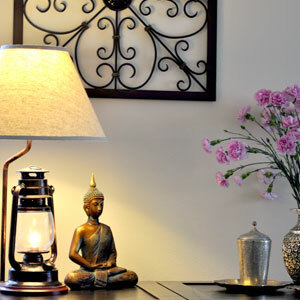 Sudha’s blog was recently featured on apartmentherapy.com, the go-to blog for design inspirations. Few bloggers seem overly concerned about readership. Blogging seems to provide such pure joy that many of the women I spoke to had never really considered developing their blogging into a business. Ethnic is in! Or so Kamini tells us. Perhaps because of the recent resurgence of interest in chronicling and preserving traditional Indian crafts. Organic fabrics, especially hemp, seem to be in. As Anuradha and Gagan note, there does seem to be a global influence in design these days. But as they also point out, each blogger has their own niche space. Patricia notes that small businesses and artisans are increasingly featured on blogs. Much as bloggers like the big spread of Anthropologie or the design aesthetics of IKEA, they do promote other DIY-ers and often feature organizations that work with artisans and source locally made and fair trade products. While Etsy gets much mention in the U.S., outfits such as Matsya or the Color Caravan in India have received the design blogger stamp of approval. A tastefully put together corner at Kamini’s: the table is an old foot-pedaled sewing machine that belonged to her mother-in-law now repurposed as a console table to hold antique brass lamps and a vase. 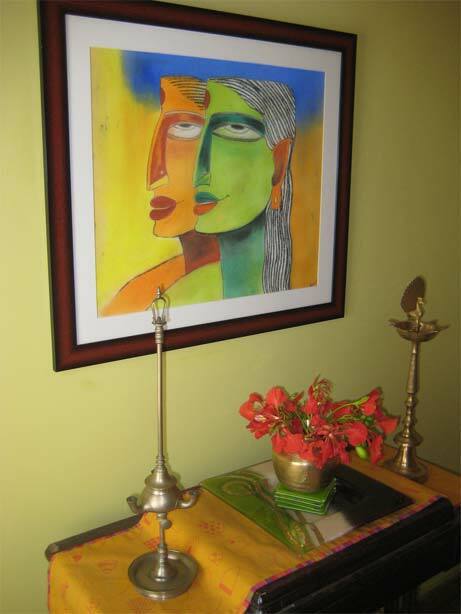 The artwork above is a reproduction in pastel by Kamini from an original by another painter. 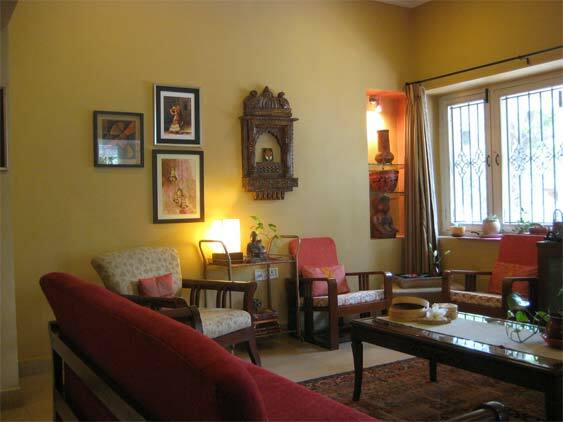 Kamini’s living room is a a blend of old and new, modern and traditional, with furniture that displays clean lines, upholstered in warm colors of red, yellow, and orange to add an eclectic earthy vibe. 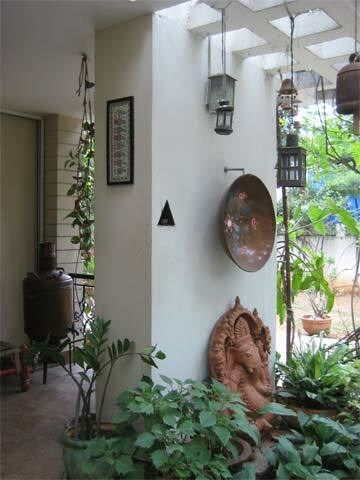 Nothing says Welcome like a terracotta Ganesha perched right by the entrance to Kamini’s home below an old iron bowl which she painted, next to a traditional triangular niche in the wall that holds lighted diyas in the evenings. Well, everything! Kamini puts it eloquently: “My grandmother’s old brass foot scrubber and silver-handled comb, my great-grandmother’s wooden trunk which held her Navaratri dolls, the 70-year-old copper boiler we used as kids for hot water...these are things that I will always cherish and will always have a place in my home.” Just about anything with soul, agrees Gagan. Music, literature, art—the list is endless. I asked the bloggers for some basic tips on interior décor that Khabar readers could incorporate into their homes. The message was loud and clear—do not be afraid to use color. And, says Anuradha, you don’t have to be an interior decorator to decorate your home. But also equally loud is this message: De-clutter every so often, for there is often a thin line between shabby chic and plain shabby. Patricia’s rule of thumb is, if you haven’t used it in six months, you don’t need it. Be merciless. Or as Sudha puts it, a simple philosophy of “one in, two out” helps with de-cluttering. Anu says, mix and match and pair cheaper bric-a-bracs with more expensive antiques or vintage items. Kamini agrees, and suggests, “Your modern armchair next to your grandma’s old antique cane chair will create an interesting tension between old and new.” Gagan adds that live plants improve air quality and are often a simple and inexpensive way to add color and interest to otherwise drab corners. As to the “don’ts”—“Absolutely no plastic anything, please!” insists Gagan. Most important, all bloggers agree, is to let your home reflect your personality. Kamini argues that there is no right or wrong in design. Do not, she says, do not let a designer convince you otherwise and put their spin on your space. In current economic times, when disposable income for interior design consultants may not be top-priority household budget items, this is indeed good advice. Color, mix n’ match, and de-clutter, loud and clear! Well that about does it for my penny finds at the local thrift store. Out you go. Now, where’s that Anthropologie catalog? shoppers can visit when in India. Some online marketplaces are Shopo.in, the Color Caravan, and the Tribal Route. 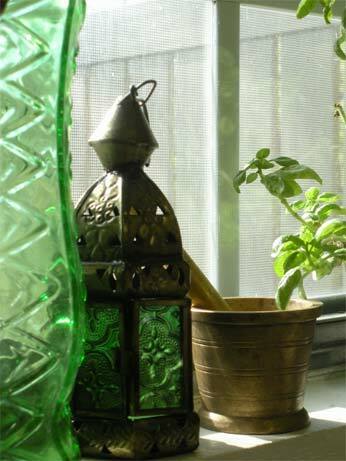 In the U.S., Ten Thousand Villages, Pier 1 Imports and Cost Plus World Market are the old standards for décor shopping. Other great online resources are etsy.com, fab.com, namaste-uk.com, vivaterra.com, plumo.com, matsyacrafts.com and indyakaleidoscope.com.